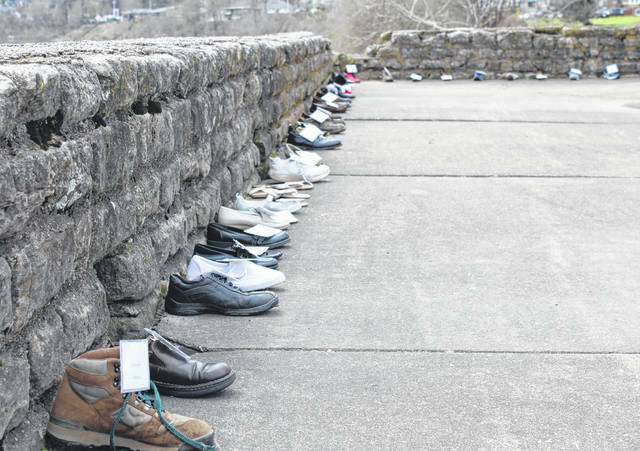 A total of 516 shoes lined the wall of the Pomeroy Parking Lot as part of the National Crime Victims’ Rights Week recognition. POMEROY — Lining the wall of the Pomeroy Parking Lot this week are 516 shoes, each with its own label. 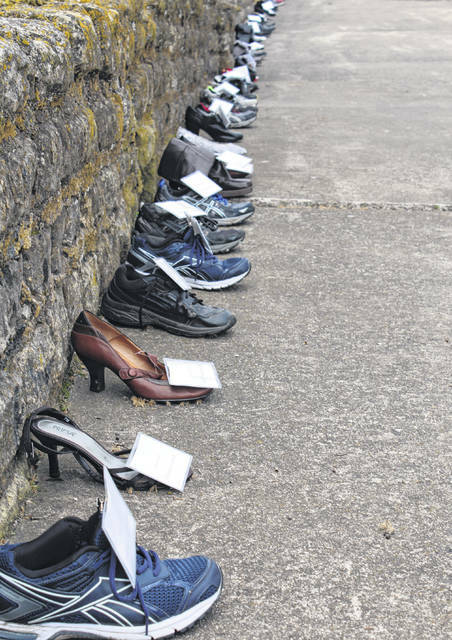 Those shoes are part of the annual National Crime Victims’ Rights Week recognition organized by the Meigs County Victim Assistance Program and the Meigs County Prosecutor’s Office. The 516 shoes are one for each new victim of crime in the county in 2018. According to the Office of Justice Programs, this year’s theme — Honoring Our Past. Creating Hope for the Future — celebrates the progress made by those before us as we look to a future of crime victim services that is even more inclusive, accessible, and trauma-informed. National Crime Victims’ Rights Week is a time to honor victims of crime as well as remember those whose lives have been cut short due to crime. The colors for the 2019 week are blue, gold and orange. In addition to the shoe display, the Homicide Victim Memorial Display is set up in from of the Meigs County Courthouse on Second Street. Students from the Eastern National Honor Society assisted with the sent up of the display, while the Southern National Honor Society students are to assist with take down of the display.